In the poker match between President Donald Trump and China’s new all-but-emperor, Xi Jinping, it’s widely assumed that Xi holds the best hand. 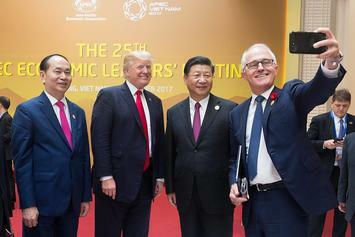 Yet President Xi’s hand may not be as awesome as it appears, while the United States, even under this very flawed president, may hold some fine cards. Of course, Xi wields power in a way that Trump could only dream about. He has close to total control over the media, academia and the business community. In a way not seen in my over three decades of travel to China, Xi has fostered a cult of personality that looms over that vast country, and even has developed a strong cheering section among western business and intellectual leaders. Trump, in contrast, faces an almost universally hostile press, an academy that detests him and an elite business community that largely fears his nationalist program. Having lost control of the House of Representatives, he is politically weakened and hardly seems a match for the Chinese leader. Yet Xi’s position is not as strong as it seems. His country, which has enjoyed one of the greatest booms in human history, is clearly losing its economic momentum. Its once all-powerful industrial sector has begun to wobble and now Trump’s tariffs, coupled with competition from other countries, threatens the principal driver of China’s economic ascendency. This decline could exacerbate what is a growing class chasm in the country. A large portion of China’s population remains very poor, and the prospects for moving up even for the educated middle class have diminished. China now suffers a surplus of college-educated people for whom the economy has little place, a potential threat to the Mandarin elite that runs the country. More serious still is unrest among China’s lower classes, particularly the over 200 million migrant laborers who drove much of the country’s remarkable growth. There have been mounting protests from this constituency, some supported by new Marxist clubs on university campuses. Detestation for the crony regime — 90 percent of China’s millionaires, notes Australian political scientist David Goodman, are the offspring of high-ranking officials — is already widespread. This is forcing Xi to focus more on economic inequality when he might rather be conquering the planet. Can the American economy live without China? China’s profound economic problems weaken Xi against Trump. The country’s rising debt, much of it tied to real estate speculation, threatens the country’s fundamental health. If China tries to become more responsible on environmental issues — it is now a bigger emitter than the U.S. and the European Union combined — it could further weaken the country’s industrial competitiveness. In contrast, despite all the hysteria from the establishment in both parties, Trump’s trade policies have not yet undermined the economy. Indeed U.S. employment, now at historically high levels, has been resurging, including in the industrial sector. Wages are increasing for manufacturing and other blue-collar workers, something that President Obama’s “progressive regime” never accomplished. As in the run-up to the Second World War and in the winning of the Cold War, America remains a country of enormous sokojikara or “reserve power,” as Japan’s Fuji Kamiya pointed out decades ago. We seem deeply divided, poorly organized, but possess a far more fertile land mass, enormous technical and potential industrial capacity that have not yet been fully deployed. The demographic dilemma — Democrats’ opening? China’s greatest weakness lies in demographics. The “one child” policy helped produce an economically convenient confluence of fewer children and more working-age people. Now China’s workforce is already shrinking, and suffers a birthrate lower than Japan’s. China will lose 60 million people less than 15 years of age by 2050 and gain nearly 190 million people 65 and over. The United States also suffers from aging demographics, but immigration has helped maintain some vitality largely. Trump, in his craven desire to appeal to his more nativist base, fails to recognize this factor. He is correct that the current chaos on the border is unacceptable, and the country clearly cannot allow in millions of largely unskilled people, which would threaten the still fragile gains of our own, highly diverse working class. Yet anyone who visits a tech company, an industrial facility or a research lab knows the enormous overall value that many immigrants bring to this economy. It’s not just brainiacs but the skilled blue-collar workers that the country desperately needs. The immigrants may also be critical for taking care of our growing elderly population, building our houses and starting new businesses. If they wish to take power, the Democrats need to integrate Trump’s economic nationalism with an immigration policy designed not as a version of global affirmative action but something that makes the country more competitive. They should not, in their fury about Trump, go back to becoming pawns of the investment banks, tech oligarchs and others who get rich exporting jobs across the Pacific. Leaders in both parties need to recognize that the moment to press the advantage with China is now.